The advent of August means quite a few things to me: my mom's birthday, the school year, the beginning of the end of summer and peak corn season. I don't know if you know about me, but I am a real, live Corn Star. Three years ago I competed in a local celebrity corn shucking contest against the mayor of Winston-Salem. There were other people there, but my eyes were on the prize and my only concern was beating the mayor. I didn't train for it or anything. I just know that the adrenaline started coursing through my veins and 1 minute later, I was declared the winner and became $25 richer. After this day, my relationship with corn changed. I've become an expert in making cornbread and even Southern-style succotash, but those are savory. Part of corn's lure is its sweet, juicy, taste of the kernels. Why not use fresh corn in a dessert? 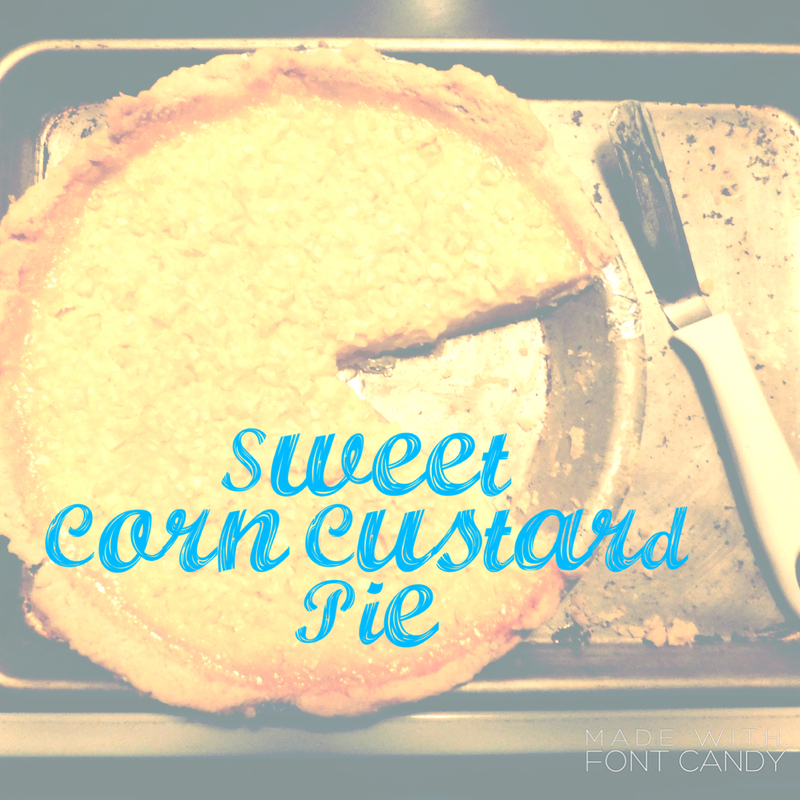 I made a Sweet Corn Custard Pie that is part buttermilk pie and part roasted corn. I puréed half of the fresh corn kernels because I like the texture of the corn popping in my mouth but you can always opt to purée it all for a smooth, creamy texture. 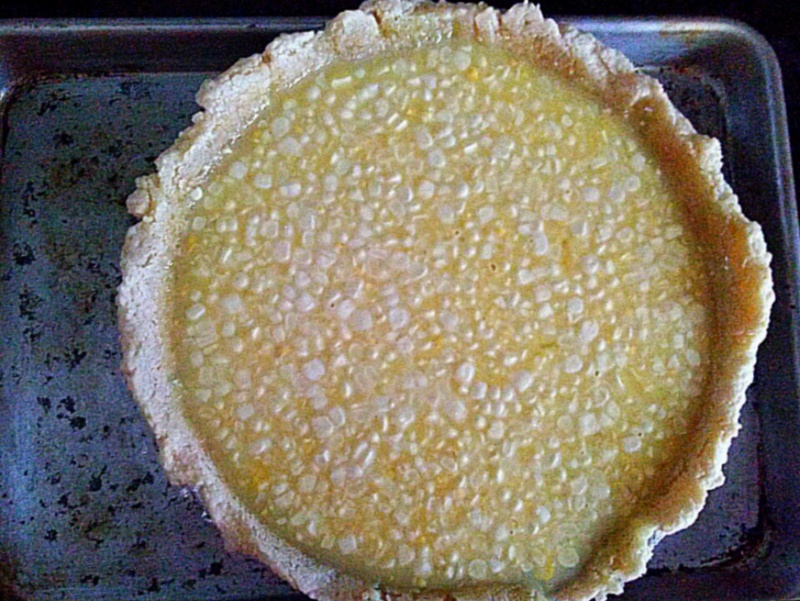 Not to forget about the singular second most important part, the pie crust, I used chilled vodka instead of ice cold water to insure its tender, flaky texture. 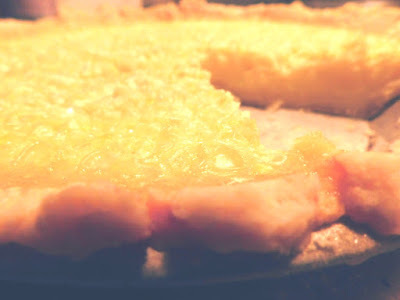 In fact, the crust kept flaking off every time I touched the pie, haha! Don't forget to check out the dozens of other corn recipes from my Sunday Supper fam. Don't forget to share the love! Preheat the oven to 350 degrees F. In a large mixing bowl, combine 1½ cups sugar, 2 Tablespoons flour, and 1 Tablespoon lemon juice. Whisk in the eggs, one at a time. Stir in 1 cup buttermilk. Put half of the corn in a blender with the buttermilk mixture. Process briefly, until the corn is chopped up without turning it into a puree. Set aside. Stir in the whole corn kernels. Pour the buttermilk-corn mixture into the pie shell and bake until the top is lightly browned and the center is set, about 45 minutes. Remove from the oven and cool to room temperature. Slice the pie into individual servings. I have never heard of a crust like this but it looks AMAZING! If this isn't the best way to celebrate summer's sweet corn, I don't know what is! Fantastic recipe! Love this sweet take on summer corn! That sounds sooo good and I love the inclusion of the buttermilk! I adore sweet corn. I'm cuckoo for pie. This recipe was made for me! Whaaa! I am in corn heaven with all these recipes! I will be checking a lot of them out, thanks! And the pie is so different, never came across that before!